Now is the time to reach out and share God with the world. - Reposition the gift of prophecy to an interpretative role. - Engage more proactively with Christian media. - Serve the unsaved world with divine abilities granted by God. - Establish an apostolic and prophetic Christian media army. Set firm foundations so the house of God can stand as designed. Learn today how you can move the Gospel forward! Obii Pax-Harry is a dynamic leader of several prayer, prophetic, and apostolic initiatives in the United Kingdom and other nations. She was used to birth the International Prayer Ministry, Women Arise, with several prayer chapters around the world. Obii also pioneered the Strategic Prayer School (now House of Prayer) Birmingham and Redditch in Partnership with Prayer for the Nations, London. These initiatives have been released into capable hands of prophetic intercessors trained under Obii’s mentorship. 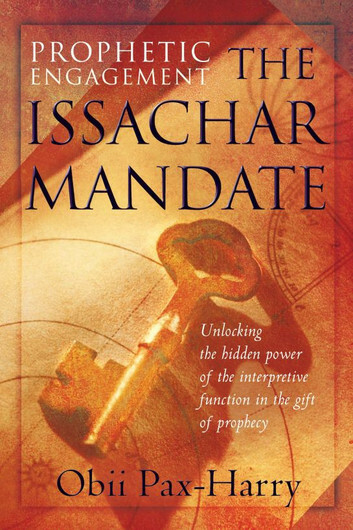 There are many good books that cover different aspects of the gift of prophecy. There are also books that help us understand the ministry and role of the prophet. Prophetic Engagement is not simply another book on prophecy. Yes, there is teaching within the book that addresses necessary foundational issues surrounding the gifts of the Spirit and how they can be profitably exercised. There is also some very good solid material on the ministry of the prophet. Those parts of the book alone would call for Prophetic Engagement to be read. If Obii had simply addressed those issues I would have wholeheartedly said “read this book” as she writes clearly, with conviction, and always as one calling us forward. However, Prophetic Engagement is much more than a good book on prophecy and prophets that can be recommended. There is much depth in this book and I suggest keeping Prophetic Engagement with you and going back over it repeatedly. Obii’s understanding of timings, timelines for nations, and how boundaries work are three other aspects I have especially taken note of. You will highlight interesting aspects as well. Obii truly carries her burdens faithfully. It is from that place, the place of intimacy, that her revelation flows. The revelation she brings accords closely to the Issachar anointing. I have heard her speak with deep insight relating to times, and even dates, and I know that as the words have been received there has been a clear call to action. She manifests in our time the Issachar anointing and prophetic engagement. I have no hesitation in recommending this book. It should be read by as many people as possible: it needs to be read by mature prophets, by aspiring young believers, by pastors, and by those in the workplace. It should be read by individuals as well as groups of people who could work through the implications together. I have no doubt it will shape many lives and help contribute to the absolutely vital release of the Issachar anointing and prophetic engagement. We are in a time of cosmic turmoil, but there is a way through. The way through is not only a way of survival, but a way of victory. It is not a pathway without pain, but it is a pathway that will lead the Body of Christ to a higher place of revelation—and a deeper place of intimacy. Finally, for those who know my own journey, my family is deeply grateful to Obii. She has proved to be a faithful friend, a prophet, a warrior to us, as indeed she and her team have been to many. I believe as you read this book you will find something of her overcoming spirit touching you too. I am grateful to the Lord for the gifts within the Body at this time. I am, and I am sure you will be, grateful for this book. Let the Prophetic Engagement be received, for it has been released from Heaven and is available in this wonderful hour of opportunity.